First hand accounts of a battle by a commanding general are rare, unless the general is the victor. Even rarer are letters from a subordinate commander to his commander explaining why he lost an action, especially when the action was in direct violation of his superior's intentions. In the following account we have not only the losing general's report to his commander, but his commander's response. In the summer of 1810, the French were about to begin their third invasion of Portugal in two years. They had just finished capturing the fortress city of Ciudad Rodrigo and were preparing to cross the frontier into Portugal. General Wellington, the commander of the British - Portuguese Army, knew his forces could not stand up to the numerically superior French forces, so he ordered a retreat. The British Light Division, under the command of General Robert Craufurd had the mission of screening the slowly withdrawing British forces. Craufurd's deployment of the Light Division was in direct violation of Wellington's stated wishes. Although Wellington never ordered Craufurd to move to the west bank of the River Coa, on 22 July Wellington wrote to Craufurd that "...I am not desirous of engaging in an affair beyond the Coa. Under these circumstances, if you are not covered from the sun where you are, would it not be better that you should come to this side with your infantry at least?" Early on the morning of 24 July, under the cover of a heavy storm, which made the night even darker, 20,000 troops of Marshal Ney's Corps moved into position to attack the British. The Light Division initially was taken by surprise and took heavy losses. Instead of retreating, Craufurd chose to defend the ground. The British position was extremely dangerous and Craufurd finally ordered a retreat A running fight began as both sides raced for the bridge that was the only crossing site of the Coa for many miles. The road leading to the river soon was clogged with wagons. A caisson overturned at a sharp bend in the steep road as it neared the river, further slowing the British retreat. 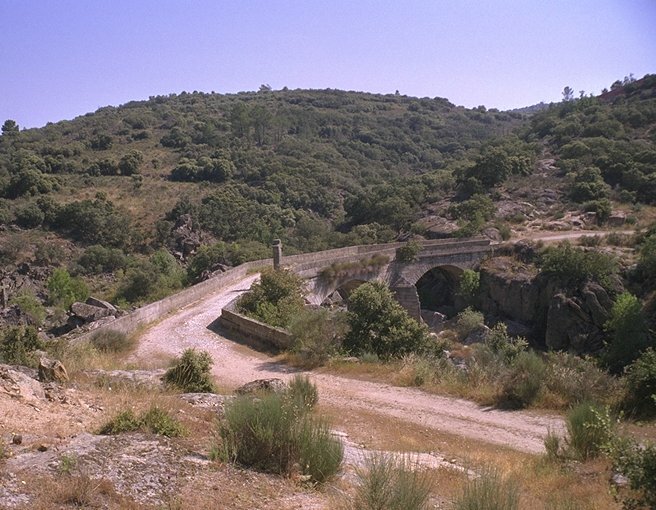 Craufurd ordered elements of the 95th Rifles and the 43rd Regiment to hold the ridge overlooking the bridge while the rest of the division crossed. Meanwhile the 52nd Regiment, which had been making a slow, orderly withdrawal, was in danger of being cut off. A mixed force of riflemen and light infantrymen from the 43rd Regiment made a furious counter-attack. The 52nd Regiment was rescued and the rear guard pulled across the river. As the units crossed, Craufurd placed them in position to defend the bridge. Marshal Ney ordered General Ferey to attack across the narrow bridge, which was quickly repulsed with heavy losses. Two more unsuccessful assaults were made, before Ney ordered them to halt. Total British losses were over 330 men or about 16% of their force. General Craufurd's report to Wellington was written in a very positive tone, which was probably an attempt to make the best of a bad situation, considering he ignored Wellington's intentions and got his division mauled! I have the honour to report to your lordship, that yesterday morning the enemy advanced to attack the light division, with between three and four thousand cavalry, a considerable number of guns, and a large body of infantry. On the first appearance of the heads of the columns, the cavalry and brigade of artillery attached to the division advanced to support the picquets; and Captain Ross, with four guns, was for some time engaged with those attached to the enemy's cavalry, which were of much larger calibre. 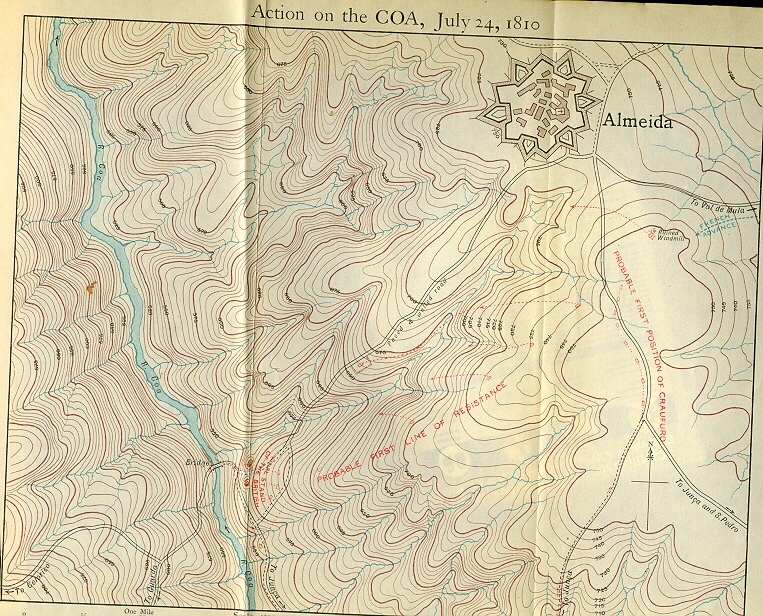 As the immense superiority of the enemy's force displayed itself, we fell back gradually towards the fortress (Almeida), upon the right of which the infantry of the division was posted, having its left in some enclosures near the windmill, about eight hundred yards from the place, and its right to the Coa, in a very broken and extensive position, which it was absolutely necessary to occupy, in order to cover the passage of the cavalry and artillery through the long defile leading to the bridge. After this was effected, the infantry retired by degrees, and in as good order as it was possible for them in ground so extremely intricate. A position close in front of the bridge was maintained as long as was necessary to give time for the troops which had passed to take up one behind the river; and the bridge was afterwards defended with the greatest gallantry, though, I am sorry to say, with considerable loss, by the Forty-third and part of the Ninety-fifth regiments. Towards the afternoon the firing ceased; and after it was dark, I withdrew the troops from the Coa and retired to this place. The troops behaved with the greatest gallantry. To Lord Viscount Wellington &c. &c.
"Although I shall be hanged for them, you may be very certain that not only I have had nothing to do with, but had positively forbidden the foolish affairs in which Craufurd involved his outposts. . . In respect to the last... I had positively desired him not to engage in any affair on the other side of the Coa... I had expressed my wish that he should withdraw his infantry to the left of the river. . . After all this he remained above two hours on his ground after the enemy appeared in his front... during which time he might have retired across the Coa twice over... You will say, if this be the case, why not accuse Craufurd? I answer, because if I am to be hanged for it, I cannot accuse a man who I believe has meant well, and whose error is one of judgement, and not of intention."